Office Christmas Party isn't good; it isn't bad. It's just ... there. Office Christmas Party does tap into some kind of pent-up HR-suppressed energy. So concerned with telling a coherent, emotionally resonate story, it often forgets to have fun with itself, eventually losing focus on chaos to adhere to convention. Lewd and crude as well as warm and endearing. But mostly it is just laugh out loud funny. As Christmas gifts go, a ticket to this movie sure beats a pair of socks. The set-pieces and memorable supporting characters do a lot to help it in the long run, but with a cast as stacked as the one it has, you can't help but be confused why it wasn't any better either. As far as by-the-numbers, big-budget major studio comedies go, Office Christmas Party is perfectly adequate. Office Christmas Party is the equivalent of a major league baseball team that has an all-star at every position -- but finishes in last place. The office party is that peculiar event where you get turnt but proceed with caution. The movie has some fun with that dilemma, and even gets the spirits up when its mixer gets anarchic. But where do you go from there? Your workplace's holiday celebration may not live up to Office Christmas Party, but you and your coworkers can have a good time watching it -- just don't tell HR. It's an odd film where the actor playing an Uber driver (Fortune Feimster) gets more laughs than the top billed stars. Perhaps there's a better party in her car. There is a world of difference between Ho Ho Ho and Ha Ha Ha. Office Christmas Party manages a little of the first and not nearly enough of the second. It's seasonally dysfunctional in ways that cannot be overcome, and while I laughed, I did not laugh enough to make sitting through the film as a whole worthwhile. A first-rate cast and some moments of sharp humor give it enough kick to be a good time. Even a third act demolition derby tribute to The Blues Brothers can't revitalize this stiff. As unimaginative as its title, Office Christmas Party starts strong but declines into nonsense. This boisterous comedy may not be art, but there are much worse ways to spend a couple of hours. Can you say: Fire up the 3-D printer so that Jeremy (Rob Corddry) can duplicate his junk? The rager's excesses are wholly predictable: cocaine, a lot of white people jumping up and down to DJ Kool, gay-panicky visuals with eggnog. 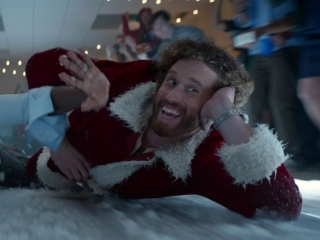 As outrageous as "Office Christmas Party" appears on the surface, it's actually a rather tame, safe entry in the growing sub-genre of raunchy Christmas comedies.